Aiken County /ˈeɪkən/ is a county in the U.S. state of South Carolina. As of the 2010 U.S. Census, its population was 160,099. Its county seat and largest city is Aiken. 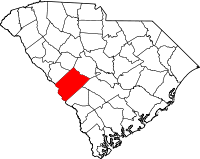 Aiken County is a part of the Augusta-Richmond County, GA-SC Metropolitan Statistical Area. It is mostly in the Sandhills region, with the northern parts reaching in the Piedmont and southern parts reaching into the Coastal Plain. Both Aiken County and its county seat of Aiken are named after William Aiken (1779–1831), the first president of the South Carolina Railroad Company. Aiken County was organized during the Reconstruction era in 1871 from portions of Barnwell, Edgefield, Lexington, and Orangeburg counties. Prince Rivers, a freedman and state legislator from Edgefield County, had been a leader in the United States Colored Troops. He was named to head the commission that drew the new county's boundary lines. He was dubbed "The Black Prince" by local newspapers, including the Edgefield Advertiser. He also led the commission that selected the site of Aiken County's present-day courthouse. Other freedmen who were part of the founding of the county were Samuel J. Lee, speaker of the state House and the first black man admitted to the South Carolina Bar; and Charles D. Hayne, a free man of color from one of Charleston's elite families. Political tensions kept rising in South Carolina during the 1870s, especially around elections. In the months prior to the 1876 elections, Aiken County was one of the areas to suffer white paramilitary Red Shirts attacks and violence directed against black Republicans to suppress the black vote. Between the Hamburg Massacre in July and several days of rioting in September in Ellenton, more than 100 black men were killed by white paramilitary groups in this county. Two white men died in the violence. In the late 19th century, the county became a popular winter refuge for affluent Northerners, who built luxury housing. The county remains popular with horse trainers and professional riders because mild winters allow lengthy training seasons. In the 1950s, Aiken County, along with the nearby counties of Allendale and Barnwell was chosen as the location for storage of nuclear materials and various fissile materials, now known as the Savannah River Site. Ellenton, South Carolina was acquired and its buildings demolished for its development for this plant. Its residents and businesses were all moved north about eight miles to New Ellenton. Developed during Cold War tensions, the facility is now scheduled for decommissioning of various parts of the site. According to the U.S. Census Bureau, the county has a total area of 1,081 square miles (2,800 km2), of which 1,071 square miles (2,770 km2) is land and 9.6 square miles (25 km2) (0.9%) is water. It is the fourth-largest county in South Carolina by land area. As of the census of 2000, there were 142,552 people, 55,587 households, and 39,411 families residing in the county. The population density was 133 inhabitants per square mile (51/km2). There were 61,987 housing units at an average density of 58 per square mile (22/km²). The racial makeup of the county was 71.37% White, 25.56% Black or African American, 0.40% Native American, 0.63% Asian, 0.03% Pacific Islander, and 1.18% from two or more races. 2.12% of the population were Hispanic or Latino of any race. 22.0% were of American, 9.7% English, 8.4% German and 7.9% Irish ancestry according to Census 2000. There were 55,587 households out of which 33.10% had children under the age of 18 living with them, 53.30% were married couples living together, 13.80% had a female householder with no husband present, and 29.10% were non-families. 25.20% of all households were made up of individuals and 9.20% had someone living alone who was 65 years of age or older. The average household size was 2.53 and the average family size was 3.03. In the county, the population was spread out with 26.20% under the age of 18, 8.80% from 18 to 24, 28.90% from 25 to 44, 23.30% from 45 to 64, and 12.80% who were 65 years of age or older. The median age was 36 years. For every 100 females, there were 92.90 males. For every 100 females age 18 and over, there were 89.20 males. The median income for a household in the county was $37,889, and the median income for a family was $45,769. Males had a median income of $36,743 versus $23,810 for females. The per capita income for the county was $18,772. About 10.60% of families and 13.80% of the population were below the poverty line, including 18.90% of those under age 18 and 12.50% of those age 65 or over. As of the 2010 United States Census, there were 160,099 people, 64,253 households, and 43,931 families residing in the county. The population density was 149.5 inhabitants per square mile (57.7/km2). There were 72,249 housing units at an average density of 67.5 per square mile (26.1/km2). The racial makeup of the county was 69.6% white, 24.6% black or African American, 0.8% Asian, 0.4% American Indian, 2.6% from other races, and 1.9% from two or more races. Those of Hispanic or Latino origin made up 4.9% of the population. In terms of ancestry, 20.6% were American, 10.0% were English, 9.9% were German, and 8.6% were Irish. Of the 64,253 households, 31.4% had children under the age of 18 living with them, 49.3% were married couples living together, 14.4% had a female householder with no husband present, 31.6% were non-families, and 26.9% of all households were made up of individuals. The average household size was 2.45 and the average family size was 2.96. The median age was 40.0 years. The median income for a household in the county was $44,468 and the median income for a family was $57,064. Males had a median income of $44,436 versus $33,207 for females. The per capita income for the county was $24,172. About 13.4% of families and 16.6% of the population were below the poverty line, including 23.7% of those under age 18 and 13.3% of those age 65 or over. ^ a b "State & County QuickFacts". United States Census Bureau. Archived from the original on July 6, 2011. Retrieved November 22, 2013. ^ a b Mary Morgan (19 March 2007). "History". Archived from the original on 2008-02-20. Retrieved 2008-03-29. ^ "2010 Census Gazetteer Files". United States Census Bureau. August 22, 2012. Retrieved March 15, 2015. ^ "U.S. Decennial Census". United States Census Bureau. Archived from the original on May 12, 2015. Retrieved March 15, 2015. ^ "Historical Census Browser". University of Virginia Library. Retrieved March 15, 2015. ^ Forstall, Richard L., ed. (March 27, 1995). "Population of Counties by Decennial Census: 1900 to 1990". United States Census Bureau. Retrieved March 15, 2015. ^ "Census 2000 PHC-T-4. Ranking Tables for Counties: 1990 and 2000" (PDF). United States Census Bureau. April 2, 2001. Retrieved March 15, 2015. ^ "US Census Bureau Demographics Data". Factfinder.census.gov. Retrieved 2014-07-31. ^ a b c "DP-1 Profile of General Population and Housing Characteristics: 2010 Demographic Profile Data". United States Census Bureau. Retrieved 2016-03-09. ^ "Population, Housing Units, Area, and Density: 2010 - County". United States Census Bureau. Retrieved 2016-03-09. ^ "DP02 SELECTED SOCIAL CHARACTERISTICS IN THE UNITED STATES – 2006-2010 American Community Survey 5-Year Estimates". United States Census Bureau. Retrieved 2016-03-09. ^ "DP03 SELECTED ECONOMIC CHARACTERISTICS – 2006-2010 American Community Survey 5-Year Estimates". United States Census Bureau. Retrieved 2016-03-09. ^ "2010 Census Population of Aiken County, South Carolina". CensusViewer. Retrieved 2014-07-31. ^ "Aiken County Government". Archived from the original on 6 March 2008. Retrieved 2008-03-29. ^ "Welcome to the Aiken County Sheriff". Aikencountysheriff.org. Retrieved 2014-07-31. This page was last edited on 21 January 2019, at 04:40 (UTC).